My daughter wanted cinnamon roll pancakes for her birthday a couple of weeks ago. 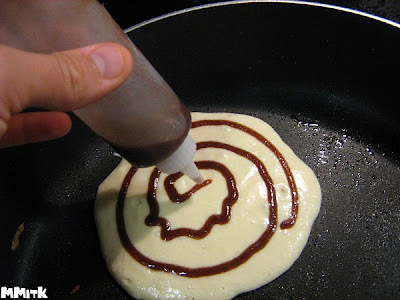 I had never heard of them, but I figured some one out there had attempted something of the sort, so I researched until I developed a plan for making the cinnamon roll pancakes happen. I ended up using a buttermilk pancake recipe that I have used before and then just used the filling from a cinnamon roll pancake recipe I found. I poured enough batter to make a pancake and then drizzled the filling around to make it look like a cinnamon roll (kind of). 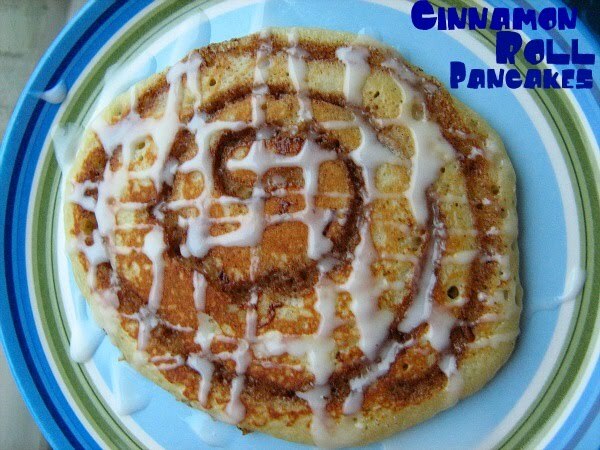 I made a simple icing and there you have it- Cinnamon Roll Pancakes. My daughter loved it and everyone else in my family was pretty happy about it too. and used the cinnamon filling recipe from that post. Warm this mixture up in the microwave in 3-4 second intervals, until it reaches a pourable consistency- you don't want it completely melted, but if it is too thick, it won't work either. I transferred it to a plastic container with a small tip, so I could make circles in the pancakes. * note- the cinnamon filling will thicken as it cools, so you might have to rewarm it in the microwave as you go, in order to get it drizzle correctly. for the icing, I just combined powdered sugar with skim milk until it was the perfect consistency for drizzling over the pancakes. This is such a cute idea. I love how they look. This looks perfect for my kids. It combines two of their absolute favorite breakfasts! Oooo, I love me some pancakes. These look delish! wow I absolutely love this idea. I am definitely saving this idea. I am your newest follower! That sounds like a really great and delicious idea. Perfect for a birthday! Thats cool how the filling settles in and looks just like a cinnamon roll! Making this for Leslie's birthday breakfast tomorrow...Wish you were coming too! P.S. Call me- I cried for you yesterday! Ew, and I have some icky news!